Total perfection are the two best words to describe this delightfully fragrant clone of Blc. Village Chief Rose ! Bearing huge 5-6” diamond-dust textured flowers, it can produce 2-3 per inflorescence when fully mature. Its ruffled petals, with their rose-red border, perfectly mimic its broad ruffled lip, carrying firm flower substance for a splash-petal Cattleya. 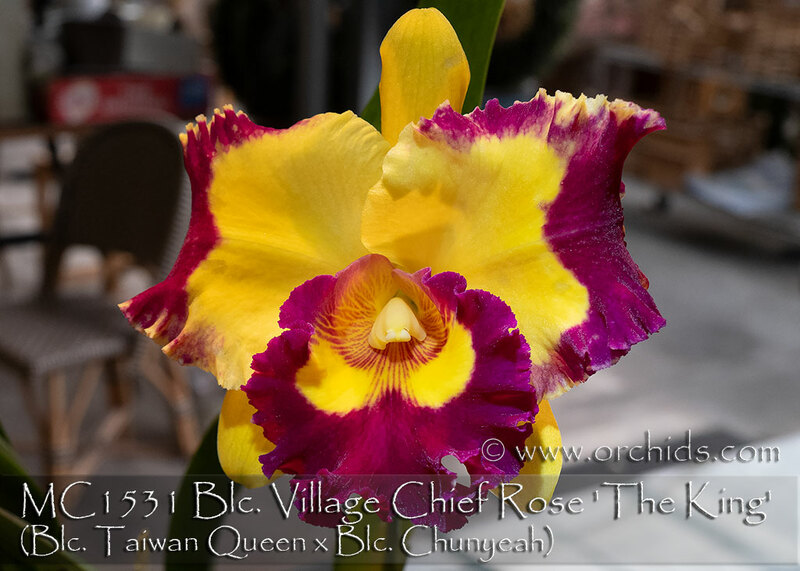 Our exclusive clone in the US, this is a very compact grower for this type of breeding, growing to only 1/3 the size of a standard Cattleya, thanks to its pod parent, Blc. Taiwan Queen with the more compact C. intermedia in its background. And, as a bonus, this clone has flowered for us in California twice a year, Spring and Fall. A real stunner when in flower and Highly Recommended!